Happy New Year! The first LBD polish of 2018 has to start the year with flash, sparkle and fun. 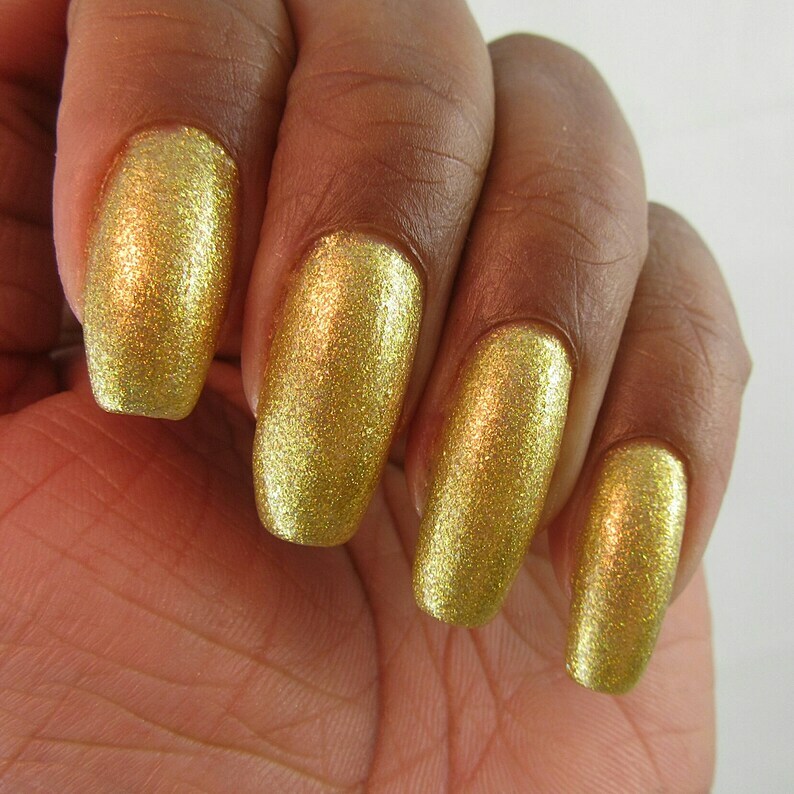 This gold glitter polish includes holographic glitter and can be worn as a topper over a black base coast, or apply two or more coats and wear on its own. Little Black Dress Nail Lacquer offers creative and versatile selections of 5-free polishes in stunning colors and finishes designed as singles, duos, sets and toppers. LBD nail lacquers are perfect for accessorizing your favorite versatile little black dress so that you're ready for any occasion. My polishes are mixed by hand, and although I strive to make each bottle exactly the same, there may be slight differences in batches. Also, keep in mind that camera settings and monitors may cause polishes to appear slightly lighter or darker. Handmade polishes tend to be a little thick or increase in thickness. If this should happen, I recommend using a few drops of polish thinner and shaking until well blended. Using acetone or nail polish remover to thin your polish is a definite no no and may destroy your polish. Formaldehyde Resin: A derivative of Formaldehyde. Dibutyl Phthalate (DBP): Banned in the UK and linked to cancer and birth defects. Camphor: Can be poisonous in large doses. If you have any questions or comments regarding Little Black Dress Nail Lacquers, feel free to send me a message. Great quality product and the color is beautiful. More green than blue, but still pretty! The polish is opaque and good quality. I loved the color and have received a lot of compliments on the polish I would definitely recommend it. Plus the packaging was unique!